I wrote this profile piece in 2003 while attending the Ryerson University School of Journalism in Toronto. A recent story suggesting that the Dalai Lama intends to quit his role as political leader of Tibet inspired me to post it. It is a mid-November evening, and Toronto is in the grip of a cold snap. Inside the Riwoche Tibetan Buddhist Temple, where incense and blazing lights warm the air, the chill of the outside world is forgotten. The temple’s leader and founder, Lama Khenpo Sonam Tobgyal Rinpoche, is wrapped in a burgundy-coloured robe, his feet clad in thin grey cotton socks. He sits cross-legged on an elevated platform overlooking his congregation. He and several rows of followers, mostly with serious faces chant the medicine Buddha mantra in unison, their bodies rocking gently to its rhythm. The Tantric incantation has a dual purpose. It is intended both to promote self healing and to energize those suffering from physical or mental illness. The process of chanting a series of syllables and identifying with a meditational deity allows Buddhists to pierce through the world of illusion (the everyday world) and express pure tones of enlightenment. On this evening, before the chanting begins, a long list of names is read aloud. It includes the Pope (John Paul II) and the victims of the Sept. 11, 2001 attacks on the United States. The peaceful atmosphere of the shrine, which is housed in a piano factory once operated by the now defunct, formerly world famous, Heintzman & Company Ltd., is enhanced by the beauty and symmetry of its decorative interior design. A pantheon of life-size, golden-skinned Buddhist deities, made of clay and painted by Bhutanese sculptor Tshewang Dorje, are arranged on an altar at the end of the room. Stylized three-dimensional clouds jut out from the blue mural, which is a backdrop for the sculptures. Each cloud supports a small, one-foot high sculpture. A row of small silver bowls, symbolizing the Buddha and his teachings, sit along the edge of the altar. 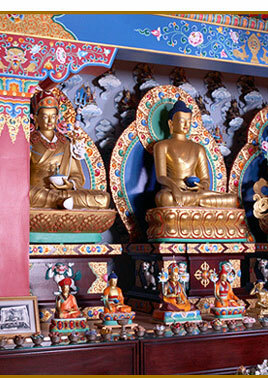 The other three walls of the shrine are decorated with a series of hand-painted wall hangings known as thangkas. If the 62-year-old Sonam is embittered by his past, it is not evident in his demeanor tonight. Sonam fled his hometown temple in eastern Tibet as a young man. He was driven out after the Chinese People’s Liberation Army suppressed the 1959 Tibetan uprising against the government of China. It was the beginning of a long journey for Sonam, who founded the Riwoche Tibetan Buddhist Temple in Toronto’s Junction neighbourhood in 1990. The end of the medicine Buddha meditation is signalled by Sonam striking two small brass cymbals together three times. After the medicine Buddha meditation on Tuesdays Sonam provides consultations — subject to the availability of his translator — and I have arranged to meet him on this particular evening. Sonam stands and smiles as I approach. He extends his hand to shake mine. After we greet each other, I sit on the floor looking up at Sonam and his translator, Shakya Dorje. Sonam sits on an elevated platform about four feet above the floor. Dorje sits on a two-foot high platform next to Sonam’s. We begin our discussion. Sonam grew up in a middle-class home near the town of Riwoche (also spelled Riwoqe), which is about 550 kilometres east of Lhasa. He was born in 1940. It is common to live with extended family members in Tibet, and Sonam lived not only with his parents, but with about 15 relatives, including paternal and maternal aunts and uncles. Tibet’s economy was based primarily on agriculture when the Chinese gained control of Tibet seven months after they invaded in October 1950. Sonam’s family included both farmers and herding people. “These occupations are separate in Tibet,”he explains. “So the farming part of our family planted the fields, and the herding part of our family took the herds out to the pastures, where they take the animals by rotation over a cycle of a year.” His family owned goats, horses, mules, sheep and yak. As a child, Sonam was sent to the temple in Riwoche — about 15 kilometres from home — to study to become a lama. His family members were devout buddhists. He says it was their collective wish that he become a religious leader. He received his designation as a lama when he was 17 years old. The process of becoming a lama is a combination of both study and practice. Under a Tibetan-Chinese agreement signed in May 1951, the two-year-old People’s Republic of China had pronounced Tibet a national autonomous region. The formerly independent country was placed under the traditional rule of the Dalai Lama. However, after the agreement was signed many thought Tibet was controlled only by the whims of the Chinese government. Dalai Lamas are believed to be human manifestations, or reincarnations, of the deity Avalokiteshvara. As protector of the world, Avalokiteshvara is believed to save living beings from suffering. He is a bodhisattva, one of a series of deities believed by Tibetan Buddhists to delay enlightenment to help others reach nirvana. Between 1642 and 1959, 14 different Dalai Lamas have ruled Tibet in succession. The 14th Dalai Lama lives in Dharamsala in northern India. Dalai Lama is an honorific title meaning “ocean of wisdom”. In 1956, the Preparatory Committee for the Autonomous Region of Tibet was formed. It too was nominally headed by the Dalai Lama, but apparently controlled by the Communists. Land reforms and the collectivization of monasteries led to uprisings that became a full-scale revolt in March 1959. The Communists, adhering to the Marxist edict that religion is the opium of the people, instituted re-education programs for lamas. According to Sonam, the lamas of the 13th-century Riwoche Temple — known as Riwoche Tsuglhakhang in Tibet — were arrested and imprisoned. The common monks and administrators were told to return to their villages to take up work as agricultural labourers. Amidst the general mayhem of the revolt, the temple was ransacked. The monasteries maintained stores of food that were seized by the army. All religious rituals were banned. Sonam says there was a great deal of looting; horses were seized. And, he says, although the weapons owned by the lamas and local people were simple — typically muzzleloaders or short swords — they were confiscated. There was some redistribution of wealth, but according to Sonam, the Communists seized a large part of it. He and five monks headed south on foot towards Pemako, a region about 450 kilometres east of Lhasa. It is south of a town called Bomi (also called Bowo) on the Indian border, and is thought to be a sacred, protective place. In times of danger, it is used as a retreat. When the men reached the Himalayan pass leading to Pemako, it was heavily snowed in. The snow in the pass melts only at the height of summer and so they decided to wait until the pass opened. After waiting two months, they were attacked by the PLA and arrested. Sonam says that a major Chinese battalion of around 100,000 soldiers moved in and scoured the region for people who were not local residents. Sonam was transported to Lhasa and imprisoned for six months, where he was subjected to a re-education program and forced labour. He left the road en route to Riwoche and fled toward the pass to India again. This time he was successful in crossing into India, although it took a year. He travelled on foot because there was no path wide enough to accommodate a horse or a yak. “I flew through the sky as much as I could,” he said laughingly. According to Sonam, many people died in the camp because Tibetans couldn’t tolerate the hot climate. The Indian government moved people to different areas where they could adapt better. He was moved to a cooler camp near the Darjiling-Kalimpang region in West Bengal, about 825 kilometres east of New Delhi. The region is between Bhutan and Nepal. Between 1961 and 1988, he moved among Darjiling, Bhutan and Nepal. In 1988, he was asked to take up a posting at a Buddhist programe in Whitehorse, and the following year he moved to Toronto. Out of an estimated 100,000 people who have left Tibet since 1959, about 600 live in Canada. Perhaps it is also karma that drew him to the old Heintzman piano factory. The late founder of the infamous piano factory was also a refugee from political turmoil in his homeland. Unsettled by the European revolutions of 1848, more than a century before Sonam arrived in Canada, Theodore August Heintzman (1817-1899) fled Berlin for the United States. He immigrated to Toronto by 1866 and founded the company that would establish Canada’s reputation as a first-class piano producer. Heintzman pianos were made by the company for more than 100 years until it merged with the Sherlock-Manning Piano Company in 1978. This entry was posted in ruminations and tagged Buddhism, Tibet, toronto on 03/03/2011 by Julie Mollins.